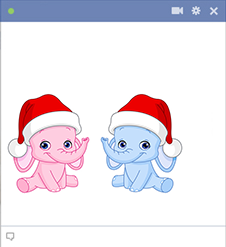 Our holiday baby elephants are delighted to share in your holiday celebration on Facebook. These cute elephants are adorable and sweet--qualities that Facebook needs in abundance. Make Facebook a more cheerful and merry place this holiday season.